49.7 mph May vary depending on road condition, rider weight etc. Take your daily commute from a tired ordinary ride into an exciting and flashy event. This All New MADDOG is 100% street legal in all 50 States including California. With top speed of 35 mph, this bike is perfect for zipping around the town or to use as a daily transportation on the city roads. 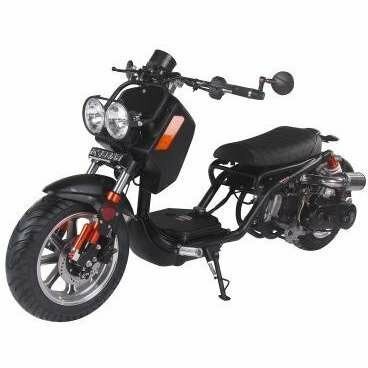 At 70-100 MPG and the gas prices are fluctuating , a motor bike is a smart choice for either a student looking for low cost transportation or anyone who commutes to work. Equipped with GY6 air cooled engine, 12" front wheel and 12" extra wide rear wheel.. Be the first one to get this beauty. This impressive and yet inexpensive motor bike will make you famous in your neighborhood as " the person with that cool bike "!